01:59 — Doctor Who: Richard Curtis to write for Series 5. 05:28 — The Sarah Jane Adventures: Series 3 to broadcast two episodes a week. 08:44 — Buy Gene Roddenberry’s Apple Macintosh. 11:03 — Doctor Horrible gatecrashes the Emmys. 11:59 – The Quatermass Trilogy. 24:23 – Escape Pod Discs: Tony Gallichan. 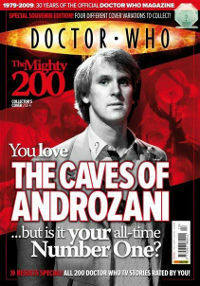 29:37 – Doctor Who Magazine’s ‘The Mighty 200’ story rankings. 63:03 – Farewell for this podcast! 63:27 — End theme, disclaimer, copyright, etc. YouTube: Dr. Horrible Gatecrashes the Emmys. Wikipedia: Quatermass and the Pit. Facebook: Doctor Who Magazine Group. Life, the Universe and Combom: DWM Mighty 200: 001 – 050. Life, the Universe and Combom: DWM Mighty 200: 051 – 100. Life, the Universe and Combom: DWM Mighty 200: 101 – 150. Life, the Universe and Combom: DWM Mighty 200: 151 – 200. Quatermass – the 1950s granddaddy of British Science Fiction TV. In our next podcast (number 55, due out any minute!) we discuss, amongst other things, the original Quatermass trilogy (as written by Nigel Kneale) and the film remakes it spawned. Given we won’t be giving too much background information I’ll take this opportunity to explain it a bit for those who aren’t all that familiar with it all. Professor Quatermass and his small team of the British Experimental Rocket Group have succeeded in being the first to send a manned spacecraft into orbit. We join the action when all contact has been lost with the craft and its three crew. Quatermass and his ground team think all is lost. Eventually their radar does pick up the craft but its clearly veered far off course, having a much wider elliptical orbit than intended. There is no voice communication from the crew. Are they dead or it is just a malfunction? Most of the, very few, previous attempts to do Science Fiction TV on the BBC were squarely aimed at children. Quatermass certainly was not, as its (progressively getting later) timeslot suggested. Initially it was screened, on a Saturday evening, at 20:25, moving steadily later as the serial became more shocking, for the final part to start screen six weeks later at 21:00. Two years later, in 1955, a sequel series was produced. Professor Quatermass is still heading up the struggling British Experimental Rocket Group, now with plans to build a lunar colony. Events bring Quatermass face to face with an alien invasion via meteorite showers, contact with such a meteor turning people into the aliens’ unwilling slaves. Very much Invasion of the Body Snatchers, before that film arrived the following year, this serial inspired (to say the least) the famous and renowned first Doctor Who story for the third Doctor, Jon Pertwee – namely Spearhead from Space. The concept of an alien intelligence slowly infiltrating the government has since been much used and in this 1955 early cold war environment it’s very easy to see where the idea might have originally come from. Like the Quatermass Experiment, Quatermass II was performed live on the night of broadcast but as the budget had been essentially doubled they could pre-record even more film inserts. A lot of that pre-recorded material took advantage of the fact it didn’t have to be tied to a studio and were the most ambitious shots ever done in British television to that time. Again Professor Quatermass’ adventures were a huge success with the (now burgeoning) British viewing public and would live on in the viewer psyche for decades to come. Apparently 90% of viewers questioned, soon after the serial concluded, had watched at least five episodes of the production. A viewing figure that little or nothing could hope for today. Perhaps the best remembered Quatermass story hit our screens at the end of 1958 and through to early 1959, in the form of Quatermass and the Pit. Partly inspired by the Notting Hill race riots of 1958 this tale told of an ancient insectoid Martian race that millions of years ago had come to Earth and genetically manipulated humanity, giving us much of our darker aspects. This story also takes the previously SF-only series into the realm of the supernatural (although all ‘explained’ scientifically, of course) with telekinesis, telepathy and racial memories. This was the final Quatermass the BBC television produced (not counting the 2005 live remake of the Quatermass Experiment, featuring Jason Flemyng as Quatermass and David Tennant as Dr. Briscoe). In the mid-60s there were plans for the BBC to make a fourth Quatermass serial but, after a difficult and prolonged gestation, it finally went to the rival ITV station in 1979. Simply called ‘Quatermass’ that serial, starring John Mills as a retired Bernard Quatermass, concluded the Professor’s adventures. As I have yet to see this particular story I shall leave talk of it until a later time! The original BBC serial of Quatermass and the Pit was, again like it’s two predecessors, performed largely live on the night of broadcast but with film inserts to cover scenes too complicated to perform live or requiring location work. Fortunately by Quatermass II the BBC had realised what they had on their hands and telerecorded the live transmission (basically pointing a film camera at the TV monitor as it was performed!) For that reason Quatermass II and Quatermass and the Pit still exist in the BBC archives and are available on DVD. 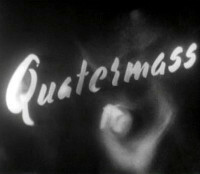 They began to telerecord the original The Quatermass Experiment (a very unusual undertaking in 1953) but stopped after the second episode as they didn’t think the results were of high enough technical quality to be resold abroad (not helped by an insect flying about the monitor (and therefore being inadvertently filmed) in episode two). Those two episodes are available on the BBC’s ‘Quatermass: Complete Collection’ DVD boxset, which contains all the 1950s TV serials and various documentaries. Besides the original BBC serials there were also corresponding big screen film adaptation made of each of the three by Hammer Film Productions. Named The Quatermass Xperiment (or, in the US, The Creeping Unknown), Quatermass 2 (US title: Enemy From Space) and Quatermass and the Pit (finally both the same name in the US and the same name as the original serial!) The first two featured, the somewhat controversial choice of, the American actor Brian Donlevy as Professor Quatermass. Donlevy being the only man, on screen, to play Quatermass in more than one story. Quatermass and the Pit starred, the much better accepted (and British! (specifically Scottish)), actor Andrew Keir as Quatermass. Keir is the only other man to have played Quatermass twice, though the second time on radio rather than screen in the BBC’s 1996 The Quatermass Memoirs. As we say in the podcast, if you are a fan of Doctor Who (or, really, British Sci-Fi in general) then you owe it to yourself to seek out Quatermass. Its impact on British Science Fiction TV cannot be underestimated. I would recommend the BBC serials over the Hammer films, at least initially (though I personally think Hammer’s Andrew Kier might be the finest Quatermass) as that way you’ll see them exactly as the original 1950s TV audience did – groundbreaking television. I would warn you though, this is very early television we are talking about, over 50 years old, so don’t go in expecting modern acting, pacing or visual effects! Close the curtains, turn out the lights and try to imagine you’ve never seen its like before! The Time & Again DWAS convention will only be allowing people from the one particular podcast to record any conversations with the guests. Clearly they are well within their rights to do so but it has ruffled a few feathers, to say the least. A heated debate raged on Twitter earlier this evening between one podcaster who would be allowed to record and another who wouldn’t. Forgive me for being vague, I don’t want to turn this in any way personal, it’s the policy I want to examine not the people on any side of the of the ‘debate’! I only name the event because people deserve to know in case the policy might affect their choice on whether to attend or not. I want to take the heat out of the situation and look at it rationally and hear other people’s opinions on the subject, should they have any. On the face of it that doesn’t sound totally unreasonable and does leave things open for the future. It does, however, totally fail to take into account the sort of social gatherings conventions are, especially in this newly connected world. DWAS, at one time, used to hold the biggest Doctor Who conventions in the world until the American cons, especially Gallifrey One, really took off. Since then DWAS have rather melted away and haven’t held one of their once annual Panopticon extravaganzas since 2003. Time and Again is very modest by comparison. Perhaps we were spoilt by Whooverville? There all podcasters were treated equally, invited in even. It was a wonderful atmosphere of freedom, fun and socialising. It was run by fans, for fans. The guests interacted with fans throughout the day in a casual way not a forced restricted way. It was utterly unlike the sort of media expo where guests are segregated from the fans and any interaction has to be paid for in advance (the organisers acting like their pimps). It’s a shame DWAS (a fan run organisation) has apparently gone at least some way down that route. Even the great (and massive) Gallifrey One has, somehow, avoided that trap. Doctor Who fandom has long since had its ‘in crowd’ of fans, a level above the ‘ming mong’ crowd. That was always a sad state of affairs and I’m sorry to see that sort of elitism still exists. I’m not asking for a fan panel like the podcaster’s panel at Whooverville. I’m not asking for the guests to be forced to talk to every person with a handheld recorder – this isn’t a publicity event for a new film, after all. All we’d like is to be able to ask a guest or a fan attendee if they’d be prepared to talk to us for a few moments. We’re not looking for long in-depth interviews – that wouldn’t be fair on all the other attendees (or the poor people we’re wanting to talk to!) Leave it up to the individual we ask to decide for themselves if they are willing to spare us those few moments. If they’d rather not, then tell them they shouldn’t be afraid to say no. We don’t consider them to be duty bound to do so, only for us not to be prevented from asking. As one Twitter user said ‘There’s a difference between denying access to guests and giving podcasters special access. A big difference.’ I don’t think any of us are asking for special access, just equal access. Whooverville was a masterstroke – invite all the podcasters along and get a lot of free publicity and general good will. Good will epitomises Whooverville. Time & Again seem to be taking the opposite view. If the bad will I’ve seen generated this evening is anything to go by then Time & Again (and DWAS conventions in general from now on) could well go down in infamy. That’s just not a way to run a convention. Those people behind this short sighted decision should do themselves a favour and take another look at it. Conventions should not be about control freakery but openness and fun. Unless I’m not seeing the full picture here, this seems like a largely pointless self inflicted wound. A wound that may fester for years to come. Reconsider. Whooverville was more than a Doctor Who convention, for me at least. A historic meeting of so many Doctor Who podcasters. It all began on a slightly chilly Butterley Train Station platform at 10AM on Sunday 6th September 2009. Four of our Staggering Stories team (Karen, Jean, Keith and myself, Adam) stumbled onto the platform to be greeted by The Colin Baker posing next to a black Dalek. Probably an unusual sight for this particular museum train station, I’ve not had the chance to return on a different morning to see if Colin and Dalek are there again – I rather doubt it. I can’t remember the order of the meetings but, like a coalescing star, somehow the podcasters were drawn together on the platform – the geekest of the geek horde that had invaded the heritage railway station. Kindred spirits! Back row: James Rockliffe from Whocast and Dad’s Army podcast, James Naughton from Podshock and Hitchhiker’s Guide to British Sci-Fi, Jean Riddler (holding the Head of Pertwee) and Karen Dunn from Staggering Stories, Marty Perrett from Whocast and Box Room, Dave Cooper from Cultdom Collective, Luke Harrison from the Minute Doctor Who Podcast. Front row: Keith Dunn and Adam Purcell from Staggering Stories. The celebrity panels were, for me, less compelling than simply hanging out with the numerous other podcasters on hand. That’s not meant as a slight on the guests as they were all very interesting people but in many ways I felt like I knew the other podcasters, it was like catching up with old friends! Besides Tony and Jo (and the rest of the Staggering Stories team, of course!) I hadn’t ever actually met any of the others. I doubt an outsider would have had any clue that was the case. For the most part I immediately recognised my fellow podcasters on sight – I’d seen their faces in pictures or videos. Any doubt (still photos don’t always give a perfect representation) was immediately dispelled when I heard their voices. Steve Hatcher, who appeared to be the main driving force behind the Whooverville convention, invited us podcasters along for the express reason of getting us together on the stage for a Podcast Panel. That was a masterstroke for getting us all together. 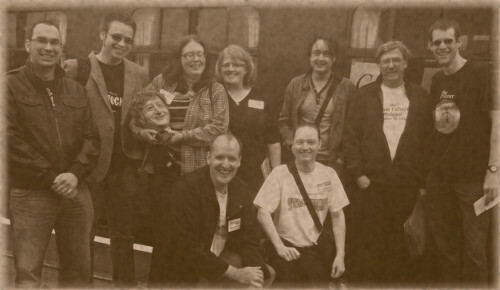 I think it is fair to say that no previous British event had brought together so many Doctor Who podcasters. Fortunately he didn’t have any dastardly plan to wipe out a good percentage of the world’s Doctor Who podcasters – it would have been the perfect opportunity had he done so, though! Back row: Tony Gallichan from The Flashing Blade, Michael from the Tin Dog Podcast, Karen Dunn and Adam Purcell from Staggering Stories, Marty Perrett from the Whocast and Box Room, Dave Cooper from Cultdom Collective, James Naughton from Podshock. Front row: Nat Titman from Bridging the Rift and Luke Harrison from the Minute Doctor Who Podcast. The podcast panel itself was lively and fun, at least from my point of view on the stage. A very slight (surprisingly slight) trepidation accompanied me onto the stage but it was very quickly dispelled. I’m hardly a natural public speaker but facing the onlooking crowds was a lot easier thanks the eight friends on stage with me. By the time all of us were up on stage and settled (squeezing 7 chairs on the small stage was not an easy task!) we had already spent about three minutes of our half hour time slot. That left us with only about twenty-seven minutes to fill. With seven and, when Nat and Luke quickly joined us (sans chairs! ), soon nine of us on the stage it’s not hard to burn through such a short amount of time – most podcasters tend to easily fill an hour or two, rambling away each week! The podcast panel itself wasn’t quite what I’d expected. I’d assumed it would be a round table affair, with a mic each or a series of mics along the table that picks us all up. That wasn’t quite what we had, instead there were about three handheld mics that we were passing between us. I’m not sure if that was a good or bad thing. The downside being that it made the panel a little more stilted than it might otherwise have been. On the plus side it stopped it getting too far out of hand and minimised any one person hogging things too much! On balance, it was probably for the best! Tony Gallichan and Jo Cummings from The Flashing Blade, Jean Riddler, Karen Dunn and Keith Dunn from Staggering Stories. So, that was Whooverville 2009. There is much more to be said about it. Seek out all the podcasts mentioned above (especially their episodes directly after 6th September 2009) to hear more. 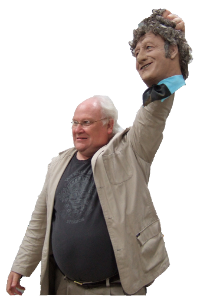 Fear yourself to tales of The Colin Baker meeting the Head of Pertwee and more! Also seek out Staggering Stories Podcast 54 – ‘Hounds of the Whooverville’ for more of our Staggering thoughts on it. The attached audio file (MP3) features a few more words from me and, more importantly, the recording of the Podcast Panel I made on the day. The background noise is a bit overpowering sometimes but hopefully it is nonetheless intelligible. Enjoy! 02:10 — Doctor Who: The End of Time named. 03:32 — Doctor Who: Big Finish licence renewed until end of 2011. 04:46 — Disney wants to buy Marvel Comics for $4b. 06:52 — Hitchhiker’s Guide to the Galaxy: Hitchcon’09 on 11 October. 08:01 — Terry Wogan quits BBC Radio 2 breakfast show. 09:03 – Doctor Who convention: Whooverville. 67:03 – Farewell for this podcast! 67:24 — End theme, disclaimer, copyright, etc. BBC Radio 2: Wake Up to Wogan. Staggering Stories: Dalek Master Plan review. Steve Caldwell’s Doctor Who Painting prints. The Minute Doctor Who Podcast. The Terrible Zodin, Doctor Who fanzine.